Raspberry soda? Raspberry fizz? Duke’s raspberry? Or as some of us used to call it, by dint of its identical packaging with a more famous soft drink: raspberry Mangola? A quick reassurance: “Raspberry” has nothing to do with mangoes. The raspberry is a fizzy drink that is unexpectedly soft on your tongue, with an aftertaste of such sweetness that it can make your teeth fall out. For generations, it was a staple at Parsi weddings, Navjotes, birthday celebrations—and at Mumbai’s Parsi restaurants. Years ago, some of Britannia’s customers asked Kohinoor if he kept any raspberry at his establishment. He first said no (because raspberry is Parsi, and his customers were not), but was quickly persuaded to relent. His restaurant is as old as he is; over time, it has gone from serving European food, to Mughlai cuisine, to its current signature Parsi-Iranian food. But the raspberry drink, after that first request, has been around for most of that time. 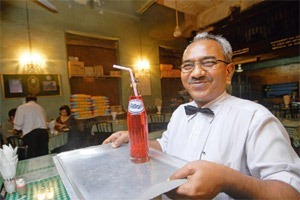 Duke’s no longer makes raspberry drinks, which Kohinoor, fond of their taste, regrets. Mumbai-based Darius Pundol, private equity fund manager and a member of the family which formerly owned the brand, says, “Even before Duke’s was sold to PepsiCo in 1993, it was a niche product which catered to certain segments. It was inextricably linked to Parsis, immensely popular in Parsi restaurants.” Pundol says that the “old, traditional formula—over a century old” was used by Pepsi to make raspberry after it took over the brand, but they eventually stopped production in the late 1990s. Representatives of PepsiCo were unavailable to comment. Now, others have filled in. About 10 years ago, Britannia restaurant began to stock Pallonji’s, a Nagpur company whose bottles are labelled “estd. 1865”. Their bottled raspberry can look alarmingly like rose sherbet, and contains, somewhere in its jewel-toned depths, a note of that very taste. Pallonji’s is also the preferred raspberry at another famous Parsi establishment in the Fort area, the restaurant Jimmy Boy, where “demand is high”, I am told, for the drink. This may be because many other Parsi restaurants don’t even stock it. It’s rare to find it in one of the usual Irani tea-and-biscuits establishments. While it’s a staple of Parsi catering, it’s no longer the ne plus ultra of beverages. “We do order it in for big, significantly Parsi banquets, such as for Parsi New Year,” says Farrokh Khambata, chef and chief proprietor, Catering & Allied, Mumbai. He says that up to 30% of people at functions still choose to drink raspberry. Taken with Britannia’s rich, fragrant berry pulao, the Pallonji’s raspberry is exactly that. Its raspberry-with-rose-notes taste is blatantly synthetic, but the tart kickback is refreshing, lighter than a syrupy bottled fruit drink, and much kinder on the tastebuds than Cola. If you have ever been a teenage girl, it will remind you of the gustatory ambitions of a Bacardi Breezer. With the tang of the mystery berries and the masalas under the fragrant rice, the raspberry washes down beautifully. In a way, it prepares you for the airy lightness of a good Parsi dessert—say, a well-tempered caramel custard—but that’s in spite of the fact that it practically steams with sugar itself, and can make you wretchedly thirsty. At weddings, they probably soak it up with the Scotch. I personally recommend a strong pot of masala chai afterwards.